Today we moved the site's CSS to a newly refactored LESS system so that it's easier for us to fix SE network CSS bugs globally and launch new features in the future! The updates also allow us to use SVG for retina support. But while we were in there, we thought it would be a good idea to update the site's visual aesthetic as well, given that this design was launched over four years ago, and Google has since launched their Material Design guidelines. We drew inspiration from the Material Design colors, typography, and animations plus the other wonderful sites and apps that use these design principles. We've fixed a LOT of obscure bugs that arose when new features were not thoroughly tested across the entire network. This update should retro-actively fix most of the old design bugs. Once the site is live, if you see any new ones, or old ones not yet fixed, please post an answer here to let us know! Overall I like the new theme. Feels much fresher. status-completed Adding images to posts doesn't seem to be working for me now. The transparent gray overlay appears on top of the modal. Trying to click the dialog instead causes a click on the transparent layer, which dismisses the dialog. This is Chrome 41, Windows 7. The below images were added by editing a post on a different site and copying the links over here. Speaking of icons, the one in the header logo on the main site is very faint. I actually like it better in green, because right now you can barely see it due to the lack of contrast. I understand if this may have been a deliberate choice, but I personally think it looks odd. Excuse my poor Paint.NET skills on this one, but here's a kind of general comparison. The icon has been updated. I like the design as well. The Ask Question button could be highlighted, à la a floating action button, in a different colour and slightly raised. 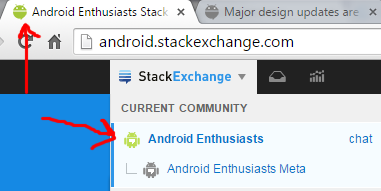 And same goes for the logo in the android app. Since when's Android blue? 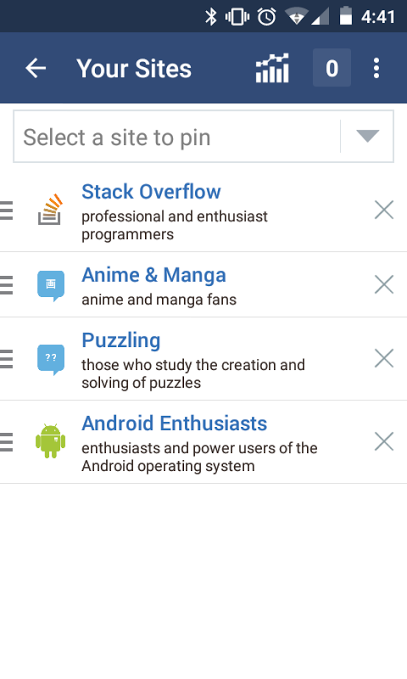 You should use the "Android green" for header and/or logo (CC-BY) listed on http://developer.android.com/distribute/tools/promote/brand.html#android-robot. it assumes that other sites have the same design, but they don't, when will this be live on StackOverflow, SuperUser, Unix, ...? There are now animations for routing actions such as hovering over a voting arrow, or clicking a voting arrow. This is horrible. Animations attract the user's attention. Attracting the user's attention to what is under the cursor is pointless: the cursor is already there. Attracting the user's attention to a routine action such as voting is wrong, especially since it's merely providing feedback that the button has been clicked. Wasting the user's attention on something that doesn't require attention is bad user experience. Please remember that you're designing a site to be usable, not to showcase the latest capabilities of CSS 4.2 on Chrome 2016. A usable interface is an interface that doesn't get in the way. Animations triggered by routine events and that grab the user's attention to tell them nothing whatsoever are the antithesis of usability. Please remove all animations that do not convey information that warrants action.